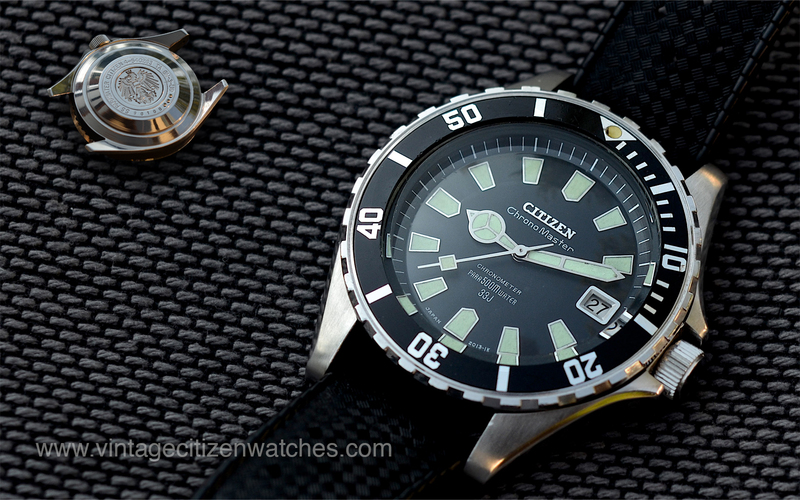 This is THE holly grail of Citizen collectors! This is one of the most sought after vintage watches! This is my dream, my so long waited one and the answer of all my intensive searches! People ask me where did I find it? I am going to tell you the story of finding this one. I started collecting vintage Citizen a few years ago. (I write this article in 2015 February) I always loved divers and chronographs. The first watch I had as a kid was a blue Volkswagen quartz “diver”. I still have that one. Then as time passed I found myself over my head into buying and selling, repairing and loosing money because of my passion, reading, writing, comparing and… you know… collecting. 🙂 I learned that there are fakes, aftermarket parts, interesting watches and common ones. I found out what I like and tried to let the other watches go. I learned not to buy only because it is a good price. I learned a lot and I am still learning. Then about two years ago a piece of information came to me. 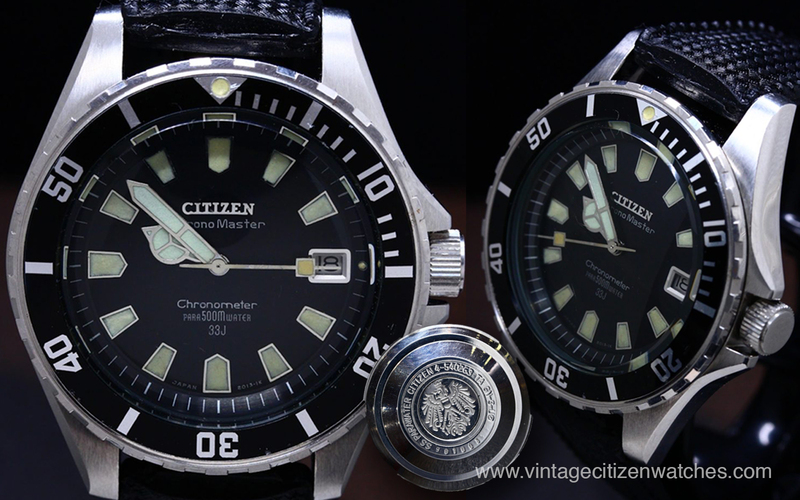 It seemed that there is a certain diver made in stainless steel, Chronomaster, 500m WR, Chronometer grade. So I started looking for one. Sometimes I dreamed about it, sometimes I thought I found a lead but time after time, it was just a mind trick. In all these years I searched for one each and every day. I found four so far. I bought one. The first one was sold as “junk” in Japan for USD 4.100. The second one I found online, on a watch forum, and has a replacement bezel and bezel insert and is not for sale. The third one, on facebook, has a replacement crown, bezel and bezel insert and non original strap and is nor for sale. The fourth one is my watch. So this is what I got: A huge 44mm one piece stainless steel case (uni body case – the movement comes out through the frontal part of the watch, after removing the crystal and the bezel of course), thick slightly domed mineral crystal, unidirectional 60 clicks bezel, screw in crown, rubber strap marvel! I got the whole package! One thing I found (June 2017) is that the eagle engraving on the back is not actually directly on the case but rather on a steel inlay (like the gold inlay used in the dress Chrono Master) I didn’t remove it but I am quite sure I am right. Anyway, back to the story. 🙂 My watchmaker opened the watch only to find a perfect movement as the one in THIS Chronomaster (but Chronometer grade – Citizen 5440). Everything works as it should! I am so happy! Well… the hunt is over, the dream has come true, the wait was long. I am tired and so happy! Thank you: Eric (Japan), Stephan (UK) , Claudiu (Romania), Jack (Singapore), Fred (Austria), Daniel (Germany) for all your contribution. You all have your part in making my dream come true! Thank you my friends! there are two dial variations: “CHRONOMETER” & “Chronometer” Why? the “Chronometer” variant has an aging yellow lume. The other remains more green. the serials range is from about 90400420 up to about 90401130 (except the January 69 pieces, the first one being is 90100xx) How do the last 5 digits of the Citizen serial actually work ? they came on 20mm straight end Tropic straps with Citizen signed buckles (and maybe another rubber strap model that I am still investigating). Read more about how to open this unibody case watch HERE. 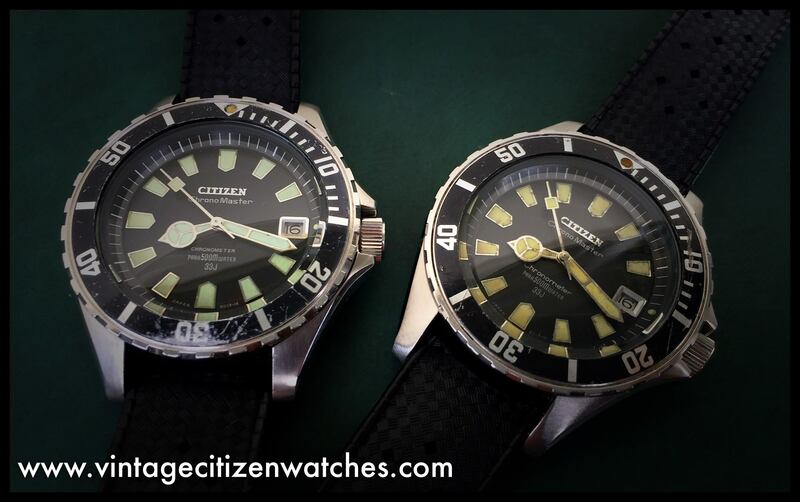 Read more about Citizen divers HERE. Read about another HOLLY GRAIL watch, the Glorious, HERE. 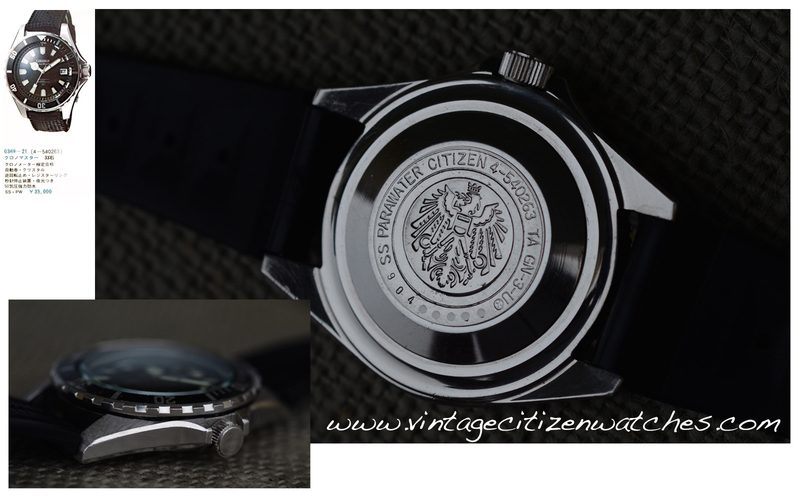 This entry was posted in Uncategorized and tagged 4-540263, chronomaster, citizen, citizen 4-540263, citizen 5440, citizen 5440 chronomaster, citizen 5440 chronometer, citizen chronomaster, citizen chronomaster 500, citizen chronomaster 500m, citizen chronomaster chronometer, citizen chronometer 500m, citizen para500mwater, citizen ta gn-3-u, citizen vintage diver, Japan, parawater 500m, ta gn-3-u, tagn-3-u, vintage citizen diver 500m. Bookmark the permalink. Watch I bought from a friend two years ago. Do you know the super auto data diver of 1967 production? I konow it and love it. 🙂 I never had one. So this is your watch and you are the one selling it? It is in wonderful condition! yes, this is nos . In the same store as the Chronomaster 500 I am out in the consignment. Another is a rare super precision. I have exhibited super jet divers to eBay. Hello Sharon! 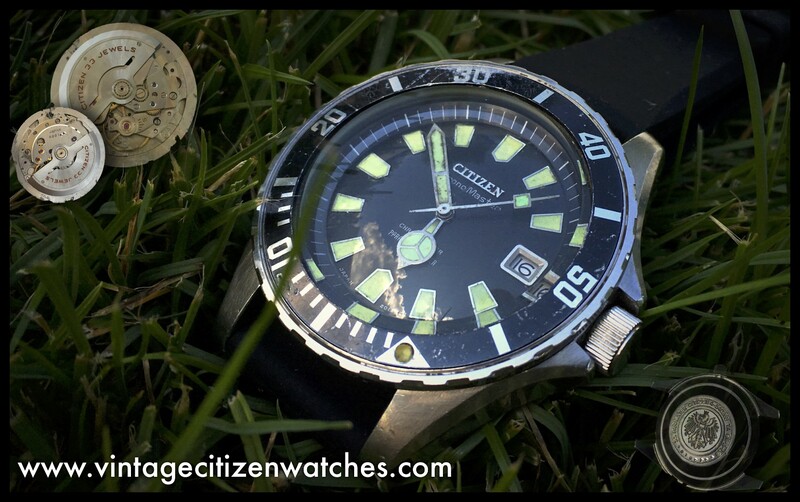 My main focus is on vintage mechanical Citizen watches, so I don’t know much about quartz. Sorry for that!